Spencer Holstege is entering his senior football season at South Christian High School. 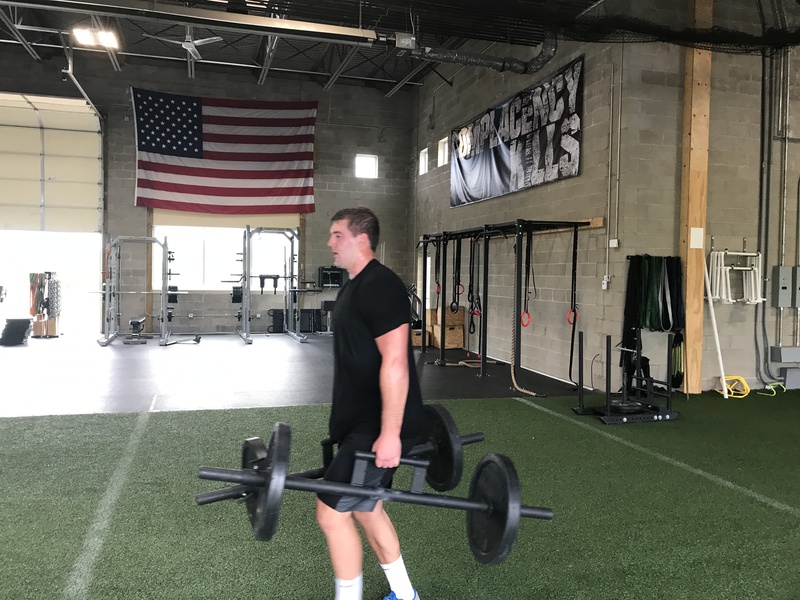 He spent the off-season at PSTS and achieved his goal of earning a Division 1 football scholarship to Purdue University. It was a hectic past year as he went on 20+ recruiting visits, over 10 combines/camps, and collected 10 Division 1 offers. Spencer’s results speak for themselves. Read what Spencer has to say in this Athlete Spotlight Interview. Scroll down to the end to read it from a father’s perspective. Football. I used to play football, basketball, and baseball, but I stopped playing this past year to create an off-season to train more on football and gaining muscle. What first brought you to PowerStrength? My SCHS teammates, the Hulst brothers, all trained there and they told me good things about it. What did you want to accomplish by attending PowerStrength? As a lineman, I wanted to get bigger and add good weight. I also wanted efficient workouts with limited time. My goal was to play college football and earn a Division 1 scholarship. I also wanted accountability from other like-minded athletes. Guys with similar goals. Describe your mindset over the past year? Before it was wanting to earn a scholarship. A lot of visits, trips, and combines/camps – a lot of decisions to make. Now it’s all about getting prepared to enjoy my senior year at SCHS with my team, and eventually, Purdue. What have your results been like since starting PSTS? What has been one of your biggest hurdles you have had to overcome in the gym? I wanted to improve explosiveness and my combine tests, which I did. I added over 3” to my vertical, while gaining over 30lbs (245lbs to 278lbs), and improved 7 reps on my 225lbs bench test. As I lineman, I can now also do over 13 chin-ups. I’m more prepared now, and feeel very confident going into the season. What do you enjoy most about being at PSTS? Being around other serious athletes on the same path as myself, and we compete, but the guys here still want to see others succeed. I’m thankful for the friendships I’ve made here. Farmer’s Walks, because it’s the exercise I can improve on the most. What exercise do you like the least? What’s your favorite music to listen to at PSTS? Rap, my least favorite is country, and it’s ironic because I come on Western Wednesday’s. What’s your favorite PSTS Value/Brick from the PSTS Pyramid? Complacency Kills – I keep striving to get better, and I know it’s up to me. What’s your favorite post-workout meal? Team Goals – Win our conference and make a deep run in the playoffs. Individual Goals – Earn Team Captain, Consensus 1stTeam All-State, and All-State Dream Team. How often do you train at PSTS? What else do you outside of the gym? What role models or coaches have influenced you the most to become the person and athlete you are today? My Dad, bringing me all over the Midwest during recruiting. He was always portraying that if you work hard, good things will happen. Also, My offensive line coach Zach Blacquiere. He helps me stay on track and keep working hard. He also has helped me a lot with recruiting. If you could give advice to younger football players, what would it be? Stay consistent, and trust the process. If you do that, it will all work out. Todd Holstege, father of Senior Spencer Holstege, South Christian H.S. “PowerStrength Training Systems has been a powerful addition to Spencer’s weekly workout routine since he joined PSTS in December of 2017. Spencer entered his Junior year of Football, at South Christian, as a TE turned left OT. Even though he was a hard worker three days a week in the school the weight room, he entered the football season at 245 pounds. 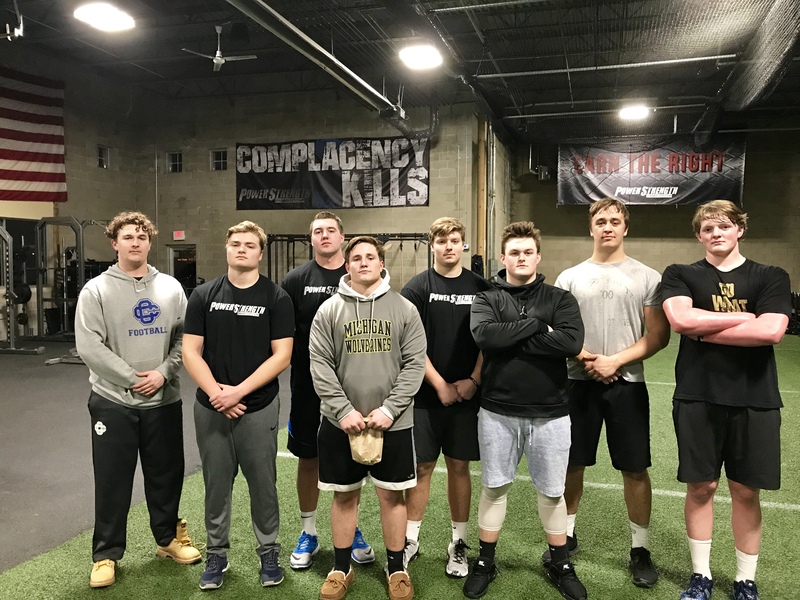 Spencer, at 6’5” and 245 pounds needed to find a way to add strength, muscle, flexibility and leadership skills if he wanted to play football at the next level. I knew Spencer needed more to help him make it to the highest level of college football. Spencer heard about PowerStrength from a few players on his team. I looked into PSTS by talking to the player’s parents and finding other players and parents who were involved at PSTS. Digging deeper, I found that PSTS was a perfect fit for Spencer to take a leap forward in his training. Spencer and I met with Mark Ehnis, owner of PSTS, and had the opportunity to sit and talk about what it was that Spencer and I were hoping to get out of PSTS. Mark wanted to know what his goals for football were and how could PSTS help him achieve them. They took Spencer, as an individual, and put together an outstanding individualized program that complemented his High School weight program. Spencer began working out at school three days a week and at PSTS three days a week. You may say, six days a week? But, PSTS does so much more than strength training. They work on the athlete’s full body flexibility, movement, and everything else to develop complete athleticism. The PSTS staff work on proper technique in ALL aspects of the things they do. They demand your best in all things and push you to be the best you can be. They want you to reach your goals. Spencer will be signing, during the early Division one signing period in December and will be an early enrollee at Purdue University of the Big 10. He is very excited to be a Boilermaker. He will always be a PowerStrength man and thanks the staff for all they have done for him to achieve his goals. More goals to reach as his senior football season begins in three weeks. PSTS will be there to encourage and support Spencer and all the athletes at PSTS. Thank you Mark and PSTS staff!! You are the best!